Evoking the feel of the Mediterranean, the owners set about to create a home that would allow them the carefree lifestyle and luxuries that they enjoyed while on vacation. 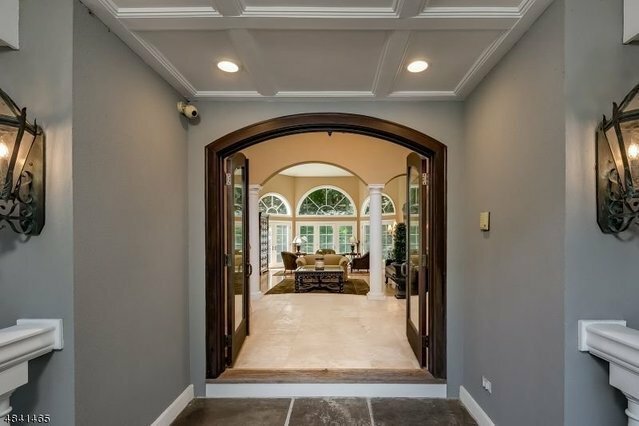 The dramatic curved double stair entrance leads to a Travertine marble foyer with pillars and archways framing the 2 story great room, a main focal point and entertaining space. A see-through fireplace sets the ambiance both in this room and the adjacent kitchen and a bay of French doors leads to the blue stone patio. A sound system through the house and the exterior further sets the stage for gatherings. There is room for expansion and a pool, should you wish. A well thought out kitchen with a large center island serves as both a prep area and buffet. Double sinks, ovens, warming drawers and dishwashers ensure a cook has the ease and abundance for creating meals. The dining room with fireplace creates a cozy atmosphere for entertaining. The right wing of the home is dedicated to the Master suite and home office. The generous Master bedroom features dual walk in closets, and a Master bath with glass enclosed shower. A walk-in pantry, laundry room, mudroom and powder room finish out the first floor. The second floor features three generous en-suite bedrooms.